The terrace we were on was tucked into the side of Posillipo ridge and faced us directly into the wind with nothing but the sea below and the pale gleam of the zig-zag path that led down to the shore. The minutes to midnight seemed frustratingly frozen. Occasional bangs boomed in the dark behind us as the trigger happy and the well-stocked warmed up. The great pirate ship of Naples was checking supplies. Then suddenly it was time. If there was a countdown we could not hear it from where we stood but we could see the old year chased away by first one scattered explosion, then a second, then a hundred, then thousands that flared in bright coloured sparks up the sides of Vesuvius and along the distant Sorrentine peninsular. But it was Naples that stole the show. A roar echoed up from her balconies and piazzas as she boomed into life. Great streaks of colour poured into the sky behind and to the side of us, and in front the Castel dell’Ovo was showered in light and drama … noise filled the senses. Each firework banged off every wall and then echoed into the sky to be caught first by the wind and then whipped around the bay. Explosions crashed and the light danced in crazy celebration of 2015 – the new baby on board. There were formal fireworks on the front of the city but they had no special rights to centre stage. Streaks of colour flared from every altitude. On the balconies of the tall apartment blocks to our left young men waged fire against wind. They hurled their arsenals into the skies – their crackle and bang met by the up-bound whoosh of explosions from below. We watched, dazzled, for an hour or so and then wound our way up through the shattered shadows to get out of the wind. A warm pause later, some two and a half hours into 2015, we stepped outside again to begin the journey home. Around us Naples still shuddered explosives. She was quieter but the sparks had not died and her roads were jammed with traffic heading away into the unknown of another New Year. We joined the traffic – sleepy shadows in the rows of headlights that bumped over the cobbles and away from the ancient shore. This entry was posted in fireworks, Italy, Naples and tagged Capri, fireworks, Naples, New Year's Eve, Posillipo, the Sorrentine peninsular, Vesuvius. Bookmark the permalink. ← Happy New Year – tanti auguri! Ahhhh. Fireworks. They bring out the child in us. Sydney Australia has absolutely fantastic fireworks on New Years eve. You are so right Lyn! I think we all have a little bit of pirate in us somewhere. 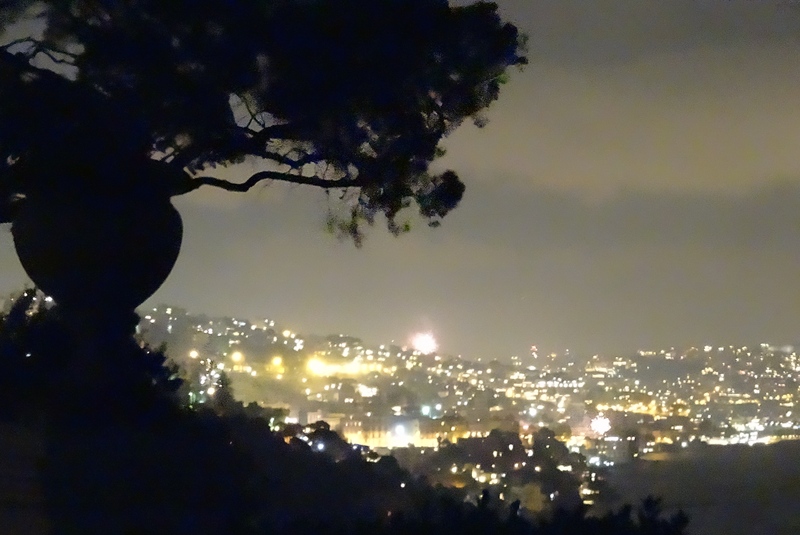 Not sure Naples could compete with Sydney for grandeur but everyone has a go … Happy 2015! Thanks – it was so cold that night – snow on the mountains and even a flurry in Naples. Happy 2015!